Due East is to perform the Metals/Pipes program at Illinois State University on March 20, 2014. More details soon. This is your first performance in Chicago, correct? Erin: This will be our Chicago debut! Excellent. It has been more than a year in preparation. Greg, you are a member of dal niente and performed with them in our concert two years ago. That’s when we first started talking about a Due East and c3 collaboration. Erin: You [Greg] knew some of the composers, and then we played at ISU, and we met Martha [Horst] down there. Greg: I remember sitting in the NIU concert hall lobby a couple years ago talking with Larry [Axelrod] about the idea. I think it was on the heels of the Dal Niente / CCC collaboration concert. In my memory the idea of focusing on metallic percussion was yours. How did that come about? Greg: There are a number of pieces that Erin and I have in our repertoire that focus on a set up that is very similar to the chosen set up for our concert. It is based on resonant metals and is centered around the vibraphone. It also includes glockenspiel, crotales, thai gongs, cymbals, tam tams, wind chimes and even a flexatone and metal whistle! The consistency of the set-up will make for very little logistical trouble on Wednesday evening, something not at all common for a percussion concert. The ability to work with seven of you within a singular setup has really minimized that issue. It has been a pleasure! And despite the limited instrumental palette, it is clear that we achieved seven very different pieces. This speaks highly of the talent of the composers in your collective. I know you guys formed back in 2001. How did Due East start? Greg: At the Manhattan School of Music I was writing my dissertation on the Brazilian berimbau. In the course of researching that I found a duo for berimbau that was written in 1979 by Lejaren Hiller, who held a professorship at SUNY-Buffalo. He took a sabbatical one year, and used it to teach in Bahia, Brazil. He fell in love with Brazilian culture, and among the various treasures he brought back to the states was a berimbau! This he used to write this piece for piccolo and berimbau at the bequest of Larry Trott and Jan Williams. Because I was doing the research, I wanted to play the piece and bring it to life again. So I was thinking about who I would ask to play the piece, and I had seen Erin in a new music ensemble concert at Manhattan School of Music. She was playing Ferneyhough and doing a really wonderful job. I asked if she would play the piece with me. She said yes, and that’s literally how the group got started. I love the name “Due East”. Its full of double entendres. I see the double entendre with the word “Due” with both its ordinary English meaning something reaching its time but also meaning “two” in Italian [pronounced DOO-ay]. The phrase “due east” means straight in the direction of east, but also could mean that you have to be out East by a particular time. Greg: It’s really about the east coast. We were in New York City, but also Erin’s family is from Halifax, which is about as far east as you can go on the American continent. Erin you have a whole family of flutes — five flutes. How did you acquire the contrabass flute? I got it in 2007. I am a member of the Argento Chamber Ensemble. We were working with Beat Furer who had written a piece for contrabass flute and narrator. It is a scene from his melodrama “FAMA.” Argento’s director Michele Galante really wanted to program the, and so he convinced me to look into contrabass flutes. I tried to find one I could borrow or rent, and I had absolutely no luck. But I did come across this maker of PVC contrabass flutes who lives in Amsterdam, I decided to invest in one. So when I got the instrument I told all of my composer friends that I was getting this beast of a flute, and they should all write for it. Its actually gotten a fair amount of use since I’ve had it and in this upcoming concert, three of the seven pieces include contrabass flute! It’s fun to walk onto stage and hear people gasp incredulously at this flute that I’m carrying. As a flutist that doesn’t happen very often. Aside from the contrabass, what are some highlights from this upcoming concert? Erin: The most interesting thing is how diverse the pieces are. All of the composers come from different “places” and styles, and so the concert is going to be incredibly varied. The pieces are all very distinctive in their voices. 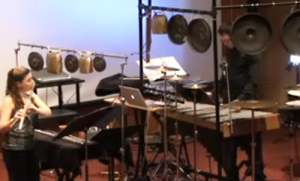 Your piece [Timothy Dwight Edwards] has these ingenious electronics generating a score for us. There are these quasi-improvised moments where we can take the materials and work with them, with software generating materials for us to work with. Julia’s piece [Julia Miller] has an element of improvisation. We actually have little holes cut into our scores that we have to look through and get inspired by what we see. Greg… a lot of polyrhythmic activity. Erin: Tim’s piece [Timothy Ernest Johnson] is the only piece with fixed media. He plays with different tunings, so it opens up a whole new sound world as well. Greg: A very beautiful piece. Greg. Yeah, a joy to play – really fun to play that piece. The flexatone is usually considered an effect. I hadn’t heard it treated as a melodic instrument. Greg: I actually had to map its range, to see which pitches it can generate, what my highest and lowest notes were, etc. Betsy wrote a fairly virtuosic couple of passages of melodic flexatone playing that’s more or less meant to be rhythmically in unison with Erin, but in counterpoint melodically. In my mind it’s a little questionable how cleanly it is coming out, but I think that’s okay, because everyone knows it’s a flexatone. I’d venture to say that of the seven pieces Betsy’s is the most traditional in its form. It’s in four movements, so it is a little suite of dances or ideas if you will. Each one is a little vignette; they don’t last long. One is high-energy; the second is mysterious; the third is sneaky; the last one is a lullaby. Each one is a little gem, and the four of them together are quite lovely to play. Laura’s piece is called Constellations. It is essentially a flute solo that I accompany in different ways. I would say that the harmonic language is very jazz-like. The harmonies that she has me playing on the vibraphone are basically seventh chords with extensions: jazz voicings. So that’s really fun to play. We were talking about the piece in operatic terms the other day, that there are recitative sections where Erin is playing very melismatically and freely, and I’m meant to kind of accompany almost harpsichord-like. And those sections are juxtaposed with other passages…really high-energy, moving-sixteenth-note lines that are in unison or counterpoint with each other. It’s fun. We are really delighted that all seven pieces are so different from each other and yet they provide a very convincing program that we are really looking forward to playing on Wednesday. It’s really great to pick your brains a little and hear your reactions to the music. Is there anything else that I should be asking? Greg: Is the concert at 7:00 or 7:30? Connect with friends and see our Facebook Event for the Metals/Pipes concert! Join us June 26 for Metals/Pipes a concert of amazing premieres performed by the incredible flute-percussion duo Due East. The concert will include new works by Martha Horst, Laura Schwendinger, Lawrence Axelrod, Elizabeth Start, Kyong Mee Choi, Timothy Ernest Johnson, Julia Miller and Timothy Dwight Edwards. Two of the pieces will involve electro-acoustic elements. 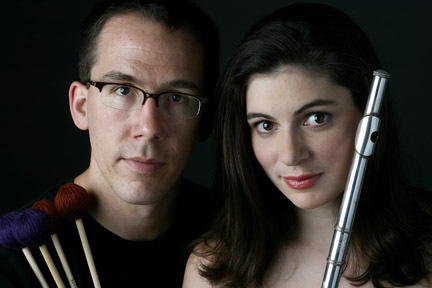 DUE EAST (Erin Lesser, flutes; Greg Beyer, percussion) actively promotes new music and seeks to expand the flute and percussion duo genre through frequent commissions and premieres. The duo has performed in China, Brazil, Europe, Canada and the USA at venues such as the Beijing Modern Music Festival, the Warsaw Crossdrumming Festival, the Banff Centre for the Arts and the SEAMUS conference. DUE EAST has given multiple performances at the Percussive Arts Society International Convention and won first prize in the 2008 National Flute Association Chamber Music Competition.